This is an advertisement for Beecham's pills. Thomas Beecham, a farmer’s son from Oxfordshire became interested in herbs and natural remedies. In 1842 he started to sell pills from his market stall in Wigan. His pills were popular and he set up a mail order business from a base in St Helen’s, in Lancashire. Beecham was aware that advertising his product was important and his first advert appeared in the St Helen’s Intelligencer in 1859. His pills were a ‘cure all’ and helped with symptoms ranging from nervous disorders and headaches to shortness of breath and stomach aches. 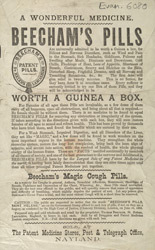 By 1888 when this advert was printed, he had opened a large factory in Lancashire and was exporting his pills around the world to countries like Africa and Australia.